Compare discounts for Hotels Motels Resorts in Nashville, Tennessee! Nashville, the capital city of Tennessee, is often nicknamed 'Music City' for it being the center of the country music industry. Nashville is a vibrant city with a lively downtown area, a busy tourist area (Opryland) a major university (Vanderbilt) and is home to many fortune 500 companies and the NFL Tennessee Titans. Nashville is a great city for a weekend getaway with great nightlife, dining and shopping opportunities. Main Nashville attractions include: Tennessee State Capitol, Vanderbilt university, the Nashville Convention Center, Gaylord Entertainment Center, Tennessee Performing Arts Center, Country Music Hall of Fame, Titans-NFL Stadium, Grand Ole Opry, Opry Mills, Opryland Resort. Note: Lists are not identical. 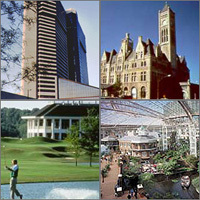 Different sites offer different accommodation options for Nashville. Music City gets down to business at Loews Vanderbilt in Nashville, TN. The Nashville Airport Marriott is located seven miles east of downtown in a campus-like seventeen acre setting convenient to Interstate 40. Nashville's newest and most exciting full service hotel is the Nashville Marriott at Vanderbilt University. The 289-room Millennium Maxwell House Hotel in Nashville exemplifies the Southern tradition of gracious hospitality. Located within minutes of downtown Nashville, The Grand Ole Opry, Opry Mills Shopping Mall, and Nashville International Airport, Sheraton Music City is ideally located for the business or leisure traveler. The Opryland Hotel is a deluxe hotel located in the Opryland complex area near Nashville International Airport. Simply walk in the door to see why the Gaylord Opryland name is synonymous with premier meeting and entertainment destinations. Retreat to the rolling hills of Tennessee, in Brentwood, just outside of Nashville. Centrally located in downtown Nashville three blocks from the Second Avenue entertainment district, the Renaissance Nashville Hotel is connected to the Nashville Convention Center and features a dramatic four-story atrium. The Radisson Nashville Airport is located on Airport Center Drive, just north of I-40 and Donelson Pike, only 1.5 miles from the airport, just ten minutes from downtown Nashville and Opryland USA. Hilton Suites Downtown Nashville is a new Upscale, Full-service, All-Suite Hotel located at the Country Music Hall of Fame in the heart of downtown Nashville. The Sheraton Nashville Downtown Hotel is a newly-renovated atrium-style, full service hotel with an elegant rooftop revolving restaurant. The Union Station, A Wyndham Historic Hotel, made of Kentucky limestone, opened it's doors October 9, 1900 and has since been a Nashville favorite. Centrally located near Nashville airport, Opryland, Cool Springs and Downtown Nashville. The Hotel Preston offers a unique alternative to the typical Nashville hotel experience. Located in the heart of Opryland, the Radisson Hotel Opryland features 303 guest rooms with one king or two double beds; rooms can accommodate a maximum of four guests. Boogie on down to 'Music City, USA' for the best of traditional Southern charm and contemporary luxury right in the heart of Nashville.